Ting-Ting Cheng, On the Desert Island (2017). Audio guide and site-specific installation at Iniva, Stuart Hall Library, London. Photo: George Torode. Taiwanese artist, Ting-Ting Cheng is the first to complete the three month residency at the Stuart Hall library at Iniva (Institute of International Visual Art), which concludes with her exhibition On The Desert Island. Cheng was given a brief to shine a new light on the library’s contents as well as its founding chair Professor Stuart Hall (1932-2014), the influential activist and cultural theorist who was part of the Windrush generation of immigrants that came over to England from the Caribbean after the Second World War. Cheng has used an archival recording of the popular BBC radio programme Desert Island Discs to lay the foundations of a unique audio-led journey across the library. After plugging in the MP3 player you will hear the uplifting theme tune of violins and seagulls flutter into the room, instantaneously transporting you onto a desert island. It revisits the original archive edition of the Desert Island Discs interview with Stuart Hall and the BBC Radio 4 presenter Sue Lawley from February 2000. You are invited to follow along the reminiscent discussion about Hall’s life, interjected with the voice of Iniva’s librarian cutting in at different intervals to direct you around the library from book to book. 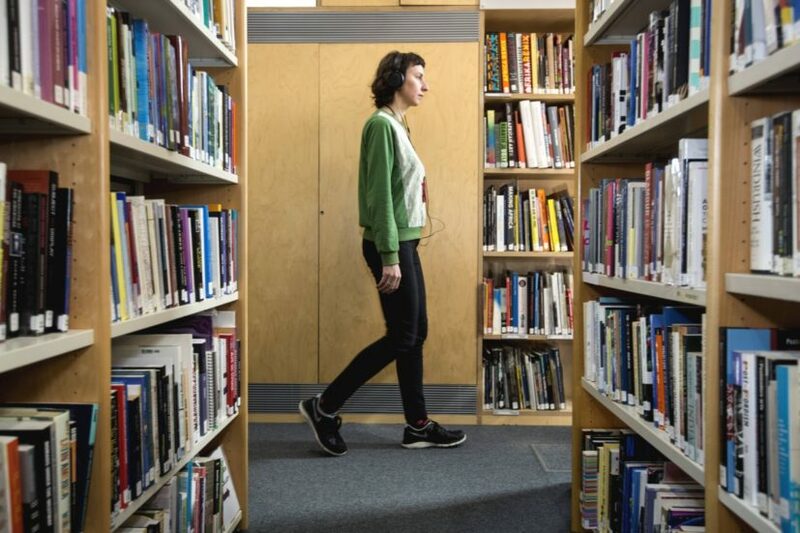 The categorization of the library enables the listener to meander between the aisles or islands, between Britain and Jamaica, confronting different ideas questioning areas of race, gender and British identity. One is encouraged to step outside of themselves and visualise the displaced and disorientated reality experienced by Hall as he found himself living in UK. Through this momentary displacement one is encouraged to consider what ‘Britishness’ is, from the iconic image of the union jack to intimate laughing family photos. 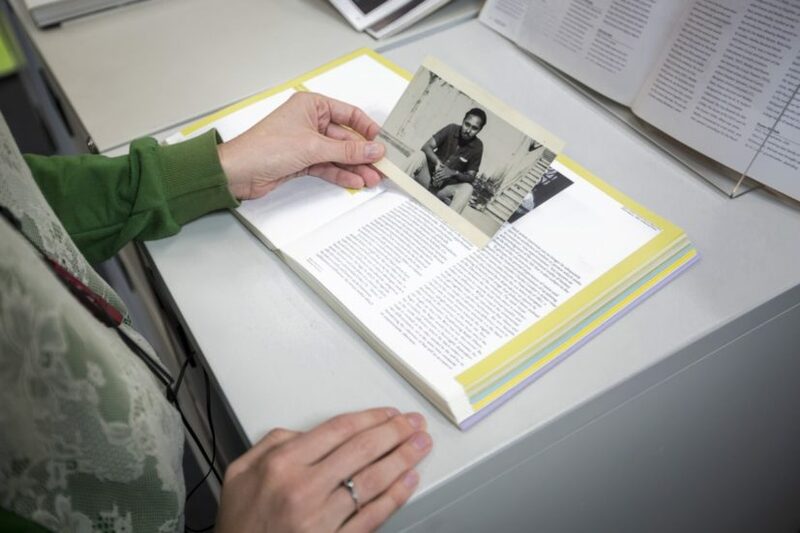 As Hall stresses in his interview when discussing British identity, being British is not one thing and never has been, therefore through the variety of archival objects that are placed along this journey, tucked into books as if for safe keeping, Cheng helps reveal the patchwork quilt of stories that make up our society. Seventeen years from when the Desert Island Disc interview took place, one is induced to reflect on today’s reality and whether we are any closer to Hall’s multi-cultural utopia as one may like to be. Born in Taipei in 1985, Ting-Ting Cheng’s work has journeyed across the globe to obtain a marvellously international presence. She completed an MFA in Fine Art at Goldsmiths in 2014 and since has participated in exhibitions in Taiwan, Japan and Spain. Politically charged and focusing on themes of cultural heritage, her previous exhibition at Xianger Art Space in Taiwan also has a participatory aspect. 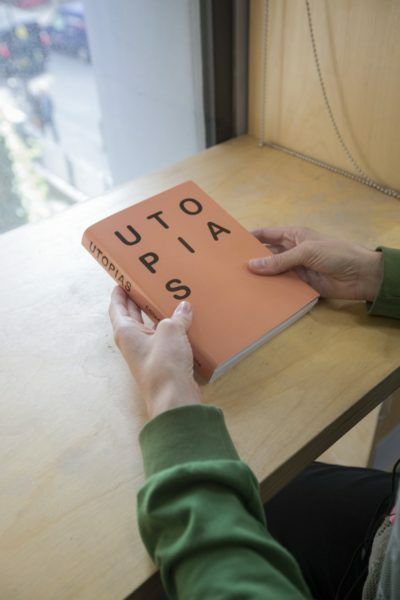 There she scrutinised the relations between Taiwanese people and South East Asian immigrants living in Taiwan, resulting in the creation of an environment in which visitors were placed inside the lives of their fellow citizens. She lined the gallery floor with mattresses covered in colourful, clashing mismatched bed sheets, mimicking the tight living conditions some immigrants were living in. She requested the viewers to read aloud scripts telling anecdotes from different immigrant workers living in Taiwan. At the Stuart Hall Library Cheng pushes the limits of the everyday gallery experience, allowing it to infiltrate on one’s individual outlook on society. She fulfils the residency brief by offering a playful way of confronting the library environment. One can gratefully digest the abundance of books on visual culture and identity that fills it to the brim and one is reminded of the oasis that a modern day library is: a space to escape, congregate and share. Moreover, the timing of this work poignantly coincides with other current tributes to the late Stuart Hall, from John Akomfrah’s film The Unfinished Conversation showing in Tate Modern’s tanks to his recent biography Familiar Stranger: A Life Between Two Island’s, edited by Bill Schwartz. On The Desert Island is in the Stuart Hall Library at Iniva till 1st December. Timeslots require an advance booking by email, each taking about 45mins- Hour.